We take a brief hiatus from our March of high-powered openers so that studios can release a few middling titles. Actually, that’s really quite okay, since Beauty and the Beast will continue to be a juggernaut, bringing much joy and happiness to the powers that be at the Walt Disney Company. The first of our new films, debuting in 3,693 locations is Power Rangers, a theatrical adaptation of the TV show from the early 1990s. Have we already gotten to the point where the ‘80s are out and the ‘90s are in? Beauty and the Beast is a 1991 release remade in 2017. 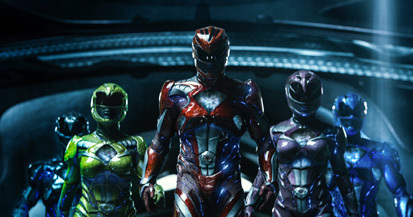 This weekend, Power Rangers will be the poster child for the decade. It’s not the first time that the franchise has come to the big screen. Mighty Morphin Power Rangers: The Movie earned a little over $38 million in 1995 (with a $13.1 million opening), but Turbo: A Power Rangers Movie only made $8.4 million during its entire time in theaters. For the 2017 version of the Power Rangers, everything has been updated to bring a more polished, modern feel to the proceedings. Alas, the reaction to the film’s trailers when I’ve seen them in theaters has ranged from somewhere between scornful and bemused. Reviews are so-so (44% at Rotten Tomatoes), but there does seem to be some sort of weird demand for the movie amongst the millennials who grew up with the show and have some lingering nostalgia for its cheesy action. I’m looking for a weekend right around $28 million.